"A tour de force. Anyone seeking a combined primer and state-of-the-art summary on almost any facet of current geographical information systems (GIS) will find it here." "Stands as a definitive reference to GIS . . . a thorough and up-to-date overview of the subject." "Remains the single-most valuable source for the dedicated GIS scholar and practitioner." "Conveys the continuing excitement that exists in GIS, the multitude of perspectives, issues, and solutions." Since the publication of the First Edition of Geographical Information Systems in 1991, the "Big Book" of GIS has become the definitive work on the science, application, and practice of GIS. This new Abridged Second Edition of Geographical Information Systems brings this definitive reference to a whole new audience, with a streamlined format, a new chapter covering recent developments in GIS, and the full text of the Second Edition of Geographical Information Systems, seventy-two chapters in all, on the accompanying CD-ROM in searchable PDF format. Unmatched in scope by any other reference on the subject, Geographical Information Systems, Second Edition provides crucial background on basic GIS concepts and addresses the radical shifts and changes that have taken place in GIS technology and its uses. Included in this Abridged Edition are twenty-four chapters covering topics as diverse as issues of space and time in GIS, problems with data quality, uncertainty and error detection, spatial analysis, developments in GIS architecture and spatial databases, GIS data collection, data transformation and linkage, implementing GIS and using it as a management tool, and the societal and legal implications of GIS and spatial information. This affordable Abridged Edition provides a convenient reader for students taking any of a wide range of GIS courses, and serves as a concise reference for professionals working with GIS. PAUL A. LONGLEY is Professor of Geographic Information Science at University College London. MICHAEL F. GOODCHILD is Chair of the Executive Committee of the National Center for Geographic Information and Analysis (NCGIA), and Professor of Geography at the University of California, Santa Barbara. DAVID J. MAGUIRE is Director of Products and International at Environmental Systems Research Institute (ESRI) in California. DAVID W. RHIND is Vice Chancellor of City University, London, and former director general and chief executive of the Ordnance Survey of Great Britain. Preface to abridged edition: New Developments in Geographical Information Systems. 1 Introduction (P A Longley, M F Goodchild, D J Maguire, and D W Rhind). (a) Space and time in GIS. 2 Space, time, geography (H Couclelis). 3 Geography and GIS (R J Johnston). 4 Arguments, debates and dialogues: the GIS–social theory debate and the concern for alternatives (J Pickles). 5 Spatial representation: the scientist’s perspective (J F Raper). 6 Spatial representation: the social scientist’s perspective (D J Martin). 7 Spatial representation: a cognitive view (D M Mark). 8 Time in GIS and geographical databases (D J Peuquet). 9 Representation of terrain (M F Hutchinson and J C Gallant). 10 Generalising spatial data and dealing with multiple representations (R Weibel and G Dutton). 11 Visualising spatial distributions (M-J Kraak). 12 Data quality parameters (H Veregin). 13 Models of uncertainty in spatial data (P F Fisher). 14 Propagation of error in spatial modelling with GIS (G B M Heuvelink). 15 Detecting and evaluating errors by graphical methods (M K Beard and B P Buttenfield). 16 Spatial statistics (A Getis). 17 Interactive techniques and exploratory spatial data analysis (L Anselin). 18 Applying geocomputation to the analysis of spatial distributions (S Openshaw and S Alvanides). 19 Spatial analysis: retrospect and prospect (M M Fischer). 20 Location modelling and GIS (R L Church). 21 New technology and GIS (M Batty). 22 GIS in networked environments (D J Coleman). 23 Desktop GIS software (S Elshaw Thrall and G I Thrall). 24 GIS interoperability (M Sondheim, K Gardels, and K Buehler). 25 GIS customization (D J Maguire). 26 Relational databases and beyond (M F Worboys). 27 Spatial access methods (P van Oosterom). 28 Interacting with GIS (M J Egenhofer and W Kuhn). 29 Principles of spatial database analysis and design (Y Bédard). (c) Technical aspects of GIS data collection. 30 Spatial referencing and coordinate systems (H Seeger). 31 Encoding and validating data from maps and images (I Dowman). 32 Digital remotely-sensed data and their characteristics (M Barnsley). 33 Using GPS for GIS data capture (A Lange and C Gilbert). (d) Data transformation and linkage. 34 Spatial interpolation (L Mitas and H Mitasova). 35 Multi-criteria evaluation and GIS (J R Eastman). 36 Spatial tessellations (B Boots). 37 Spatial hydrography and landforms (L Band). 38 Intervisibility on terrains (L De Floriani and P Magillo). 39 Virtual environments and GIS (J N Neves and A Câmara). 40 The future of GIS and spatial analysis (M F Goodchild and P A Longley). (a) Making the GIS efficient, effective, and safe to use. 41 Choosing a GIS (T Bernhardsen). 42 Measuring the benefits and costs of GIS (N J Obermeyer). 43 Managing an operational GIS (L J Sugarbaker). 44 Institutional consequences of the use of GIS (H J Campbell). 45 Managing uncertainty in GIS (G J Hunter). 46 Liability in the use of GIS and geographical datasets (H J Onsrud). (b) Data as a management issue. 47 Characteristics and sources of framework data (N S Smith and D W Rhind). 48 Characteristics, sources, and management of remotely-sensed data (J E Estes and T R Loveland). 49 Metadata and data catalogues (S C Guptill). 50 National and international data standards (F Salgé). (c) GIS as a management tool. 51 GIS for business and service planning (M Birkin, G P Clarke, and M Clarke). 52 Managing public discourse: towards the augmentation of GIS with multimedia (M J Shiffer). 53 Managing a whole economy: the contribution of GIS (J Smith Patterson and K Siderelis). (d) The impact of broad societal issues on GIS. 54 Enabling progress in GIS and education (P Forer and D Unwin). 55 Rethinking privacy in a geocoded world (M R Curry). 56 National and international geospatial data policies (D W Rhind). 57 GIS in the utilities (J Meyers). 58 GIS in telecommunications (C Fry). 59 Transportation GIS: GIS-T (N Waters). 60 GIS in emergency management (T Cova). 61 GIS in land administration (P F Dale and R A McLaren). 62 Urban planning and GIS (A G-O Yeh). 63 Military applications of GIS (D Swann). 64 Applying GIS in libraries (P Adler and M Larsgaard). (b) Social and environmental applications. 65 The rebuilding of a country: the role of GIS in South Africa (D R MacDevette, R J Fincham, and G G Forsyth). 66 Health and health care applications (A Gatrell and M Senior). 67 GIS and the geography of politics (M Horn). 69 GIS and landscape conservation (R J Aspinall). 70 Local, national, and global applications of GIS in agriculture (J P Wilson). 71 GIS in environmental monitoring and assessment (L Larsen). 72 Epilogue (P A Longley, M F Goodchild, D J Maguire, and D W Rhind). Student-priced edition makes the material available to a wider audience than ever before. Contains the most relevant and important papers from the second edition of the "Big Book". 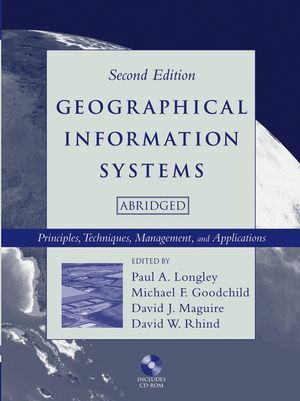 Accompanying CD-ROM includes the full text of the second edition of the "Big Book" (Geographic Information Systems) in PDF format, encompassing over 1,000 pages of the seminal writing on GIS. New Introdutory chapter by the editors described new developments in the field and how it has changed since the last edition of the book. Summarizes state-of-the-art knowledge and best practice for the wide range of users. Explains recent developments, and anticipates possible future directions. Provides full cross-references and linkage between related themes.